It is always nice to find a favorite winery producing a new varietal. That’s the case with this Hess Select Pinot Gris ($12-14). 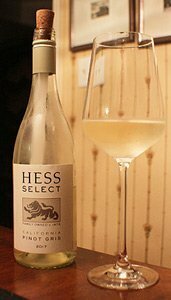 Hess has made a Mount Veeder Pinot Gris available only at the winery. It is a terrific wine, but it is twice the price of this wine. This is the first vintage for the more widely available pinot gris. I love pinot gris, and I am glad to see it more widely planted. It is the same grape as pinot grigio, but depending on where it is grown the wines can taste wildly different. You would never confuse this wine with a pinot grigio, for instance. The pinot gris in Oregon and Washington is more like the opulent style from Alsace. Often there are flinty or mineral-laden flavors. This wine falls into that group. The Hess pinot gris starts with a pleasant pale yellow in the glass with aromas of ripe pear and apricot. It is a pleasingly complex wine, and the flavors that jumped out at me were stone fruits like peaches and apricots, with some pineapple and citrus. It is a crisp, refreshing wine that can be a nice thirst-quencher in the warm months ahead. Hess gets the grapes from its own vineyards and from first-rate growers in the best regions around the state. Hess wanted vineyard sites that produce grapes with approachable acids and balanced fruit notes. The wine never touched oak, keeping the bright, fresh flavors. The grapes were fermented in stainless steel to preserve the tropical fruit characteristics. There was some lees stirring to build body and highlight the stone fruit flavors. The Hess Select Wines are part of The Hess Collection that includes some great wines from Mount Veeder in Napa Valley, a Napa Valley series, an Icon series, Artezin wines and a small block series available only at the winery. I also recently tasted the Hess Select Treo, a red blend, and it is a terrific wine priced around $20. The pinot gris comes in a convenient screw cap bottle, making it even handier for spring and summer picnics or trips to the lake. Serve this wine well chilled and let it warm up in the glass. 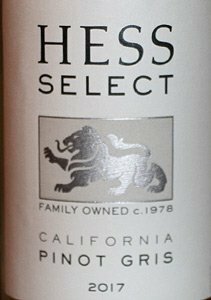 Winery: Hess Select wines are part of The Hess Collection, headquartered on Mount Veeder in Napa Valley with wineries on four continents. The company has been around since 1844 when Hess Family Estates was founded in Switzerland. The winery owns vineyards scattered throughout Napa Valley in diverse areas, from cool climate to hot and from steep slopes in the mountains to gentle slopes near the bay. The winery is best known for its flagship Mount Veeder cabernet sauvignon and chardonnay wines, and single vineyard designates from estate vineyards in Napa Valley. Donald Hess, the fourth generation of the family to run the business, opened the Hess Collection Winery on Mount Veeder 2,000 feet above Napa Valley in 1978 and has continued to grow the company. Hess leased buildings from The Christian Brothers until he built his own modern winery that includes 13,000 square feet of Donald Hess’ personal contemporary art collection. Just seeing the art collection is worth the drive up Mount Veeder. In 2008 The Hess Collection was among the first 10 wineries to receive certification as a Napa Green Winery. In spring, The Hess Collection purchased 24 goats – all of whom turned out to be pregnant – for ground clearing and underbrush management in their Mount Veeder estate vineyards. Now, a large herd of goats are released into the vineyards prior to bud break to help with weed control, minimizing the use of tractors and tilling. In 2011 Donald Hess formally retired from The Hess Collection and Hess Family Wine Estates. His son-in-law Timothy Persson was named to lead The Hess Collection as Chief Executive Officer, the fifth generation of the Hess family to provide leadership. The company also owns wineries around the world, including Peter Lehmann Wines in the Barossa Valley of Australia, Colome and Amalaya in Argentina, Glen Carlou in South Africa and Artezin in Napa. 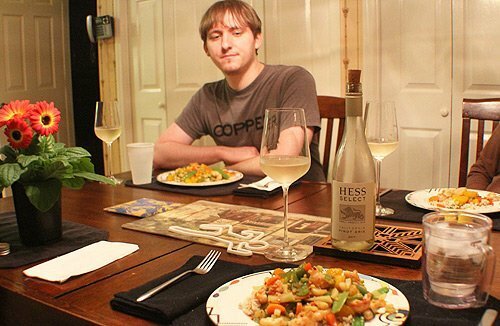 Michael enjoyed the stir fry and the Hess Select Pinot Gris. Goes with: We had this with stir-fry shrimp and vegetables and it was a great pairing. We brought the shrimp back from a trip to Edisto Island and cooked them with a selection of fresh vegetables. I served the dish over rice. We had enough vegetables on the plate we didn’t even need our usual salad. I love to stir fry because you can toss anything in that you have on hand. You don’t even need a recipe, but I’m including one to get you started if you are a novice. The fruit and fresh acidity of the wine were a great match for the complex flavors of the stir fry, which included carrots, celery, bell peppers, onions, snow peas, water chestnuts and Mandarin oranges. Each bite was a different flavor that brought out a different aspect in the wine. This is a versatile food wine that will pair well with a wide variety of dishes, including all kinds of chicken, fish and lighter meals. Here is my recipe for stir-fry shrimp. In a wok or large frying pan, cook the shrimp and ginger in hot peanut oil, 350-400 degrees. Remove the shrimp when they start to turn pink and add small amount of oil to the wok. Cook the vegetables in the oil for 2-3 minutes. Don’t let them get soft. Add the shrimp back in and stir together. Add the sauce and cook for another minute or two to blend the flavors. I usually put the snow peas in near the end of the cooking. Add the oranges after you have taken the wok off the heat and mix them into the stir fry. If you let them cook, they will fall apart.